I had a recent conversation with a friend and after thinking about the nature of our discussion, I made a note to write about the topic of connecting with a father who's been missing in action in his kids' lives. There are various reasons that dads go missing - some good, some not so good. With this post, I'd like to focus on dads who knowingly choose not to be involved in their kids' lives - the absentee dads. In our world today, single parent households are as common as two parent households - and in some communities, it's the rule, not the exception. More often than not, the single parent is a mother. She works day and night to keep food on the table. The father of the kids is often nowhere to be found. So the mom raises them alone. Still, in every child lies the need for a father and a mother. It's not unusual for kids who grow up with loving, single mothers to express a longing for a relationship with their dad whom they've never met. Some even go into depression as a result of it. Others devote themselves to finding their dads and embark on a lifelong mission to do so. Often, the kids do know their father but he's only another person who they know. 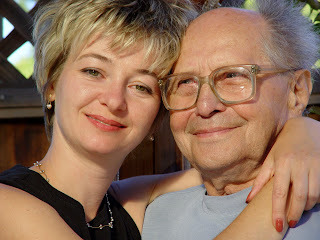 There's not a close, loving, parent/child bond - their dad is more like an acquaintance. He comes and goes just like the wind. I saw a movie recently and I found a particular scene pretty funny but still quite realistic. A father stopped by the home where his infant son lives along with the child's mother. When she opened the door, he said, "I'm here to pick up my son." He then walks over and picks up the baby and plays with him for about 20 seconds. Then he puts him down and says, "I'll be back next week to pick up my son." Funny isn't it? Still it sends a strong message. So how do children who grew up without a close, loving father establish a relationship with him? Certainly when they are young, they have very little control over it. They have to deal with things as they are. But kids don't stay young forever. As a child in school, I was taught, "The boys and girls of today will be the men and women of tomorrow." 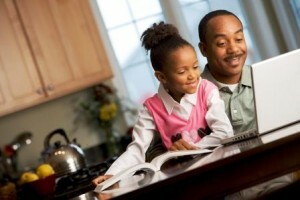 As kids grow, they can independently choose to establish relationships with their dads. My friend who I referred to earlier in this post did just that. She grew up with a single mom. She didn't know her father. She was told things about him that weren't exactly flattering. But still she wanted to know him. As she grew older, she did meet him. And as she did, she wanted to establish the relationship with him that she never had. It was a bit awkward at first. How do you get to know someone whose blood literally runs through your veins but who you know didn't really have you as a top priority? It's difficult, no doubt. In her case, she did establish a relationship with him - one that he actually welcomed. Now they have a loving friendship. She's an adult now and as she speaks of him, there's nothing but a big smile on her face - not the negativity that many have after meeting their "long-lost" dads. She also told me that since her father became a part of her life; both of her parents have become reacquainted. And it quickly became evident that there's some underlying tension between them. So then, it's not difficult to understand why, when their relationship ended, they didn't have anything to do with each other, despite the fact that they had a child together. This leads me to touch on a point that I think cannot be ignored in this area. Not everyone who's been labeled "deadbeat dad" is deserving of that title. I don't know of the specifics that led to my friend's father leaving. But this I do know, sometimes men are treated horribly by the legal system and by the mothers of their children. They then make the conscious decision to stay away altogether. I don't endorse staying away from your kids under any scenario but I do understand the frustration that causes some to give up. One of my tenets is that, it doesn't matter how horribly you've been treated by the legal system or anyone. I didn't particularly enjoy my divorce about 10 years ago (See The Story Behind The Upbeat Dad). But in the midst of all of that, was my innocent, sweet three year old daughter. If I walked away in frustration, that would have left her more vulnerable. So my encouragement to men is to hang in there and do what's best for the kids because a father is just as important as a mother in the lives of children. It saddens me to listen to men tell me of cases where their kids were told that they didn't love them so they left. I've also heard dads say their kids were told that they had died. So very sad but not altogether uncommon to hear such stories. My encouragement, as I conclude this post is twofold. For fathers who need to connect or reconnect with their kids I say this: your kids need you, regardless of what you or they may have ever been told. If you've been in the wrong, just make it right. First, forgive yourself and then seek their forgiveness. No one can change the past. But you can turn the sadness and bitterness into something beautiful, with thoughtful consideration. I don't claim that this process is easy but it's very necessary to establish the loving relationship that your kids deserve. For those who don't enjoy the loving relationship with their dad that every child deserves, I encourage you to be open-minded. You may be a child as you read this. Or you may be an adult. But whatever the case, there's a void that can only be filled by establishing that bond with your dad. If your dad walked out on you and/or your mom, I encourage you to develop a forgiving heart. Some fathers never cared and never will. But many do care and when they come to realize the error of their ways, it's good for you and them when you forgive. If you long for a loving bond with your father and never quite get what you desire, just know that life throws us some "curve balls" at times. That we cannot control. If you don't get what you desire from your dad, just ensure that if you are a dad, you shower your kids with love. Give them what you never received. Don't be bitter; but rather, become better from the situation. Life is short - very short. I do hope that the thoughts shared in this post have been a source of encouragement. If you know others who would benefit from what I've shared here, do pass it on to them. I believe that it can make a lasting impact. And hearts can be touched and healed in the process. Thank you for writing this. My ex-wife, my son's mother, is a deadbeat mom. I can apply the story about the dad who comes to "pick up his son" directly to her. She can somehow look herself in the mirror and find it ok that she only see her son for a few hours every other month or so. What's amazing is that somehow I allow myself to feel gulity about it. I feel like I should be making more of an effort to involve her in our son's life, but every time I reach out to do just that she disappoints him. It's really a frustrating situation. Enough about my problems...great blog. I'll be reading more of it! Have you ever read "Fatherless America" by David Blankenhorn?